Pioneers in the industry, we offer cnc machine cutting oil from India. We are established suppliers, traders and sub-dealers of CNC Machine Cutting Oil that is also referred as DNR Apple Cut Plus Oil. It is extensively used for maximizing life of cutting tip by maintaining stable temperature and lubricating working edges of CNC or VMC tools. It is also appreciated for reducing tip welding and is environment friendly. Our clients can avail the same at leading industry rates. Packaging Details: 35 Ltrs Stakable can be kept one upon other. 210 Ltrs Plastic Hdpe Barrel. 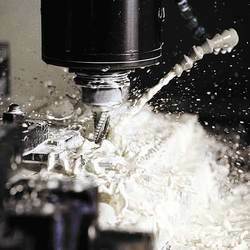 Looking for CNC Machine Cutting Oil ?